In the manga, this card was molded by Kaito from Number 28: Titanic Moth, which was molded by Haruto, after Kyoji turned it blank again. The Titanic part of its name is derived from Titanic Moth. 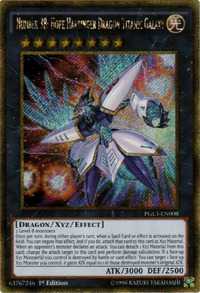 This card's ATK, DEF and Rank/Level match those of Galaxy-Eyes Photon Dragon, Kaito's signature card. This monster bears several resemblances to the AMX-004 Qubeley from the Gundam series. Other than overall color and shape of the armor, it possesses the same striped pattern found on the right shoulder and skirt of the Qubeley, with the vents on the left shoulder being replaced by its number '38'. This card also bears slight resemblance to the Zeong from Mobile Suit Gundam, with the large skirt armor and lack of any defined legs. This monster's wings resemble those of Crystal Wing Synchro Dragon, another Level/Rank 8 monster with 3000 ATK and 2500 DEF, and Galaxy-Eyes Full Armor Photon Dragon, another Galaxy-Eyes monster.